"Massachusetts, Death Index, 1970–2003", database, Ancestry.com, "Sackett, Dwight P, d. Melrose, 21 Nov 1981, b. Utah, 28 Feb 1912." US Social Security Administration, "Social Security Death Index", database, American Ancestors, "Dwight Sackett, b. Feb 28, 1912, d. Nov, 1981, SSN 578-16-1962 issued, residence Melrose, Massachusetts, 02176, county Middlesex." Sackett, Edward, son, 13, b. UT, father b. IL, mother b. Eng. 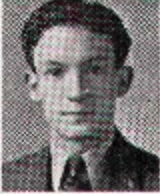 "US School Yearbooks, 1880–2013", digital image, Ancestry.com, Granite High School, Salt Lake City, Utah, 1931, "Football State Champions 1930, Dwight Sackett, End, "Sacky" played end for us this year. His fight and spirit enabled him to stop many a runner for the "Fightin' Farmers." He has played his last ball fro Granite. "; "Orans Club, members, Dwight Sackett. "; "Spanish Club, members, Dwight Sackett." "US Department of Veterans Affairs BIRLS Death File", database, Ancestry.com, "Sackett, Dwight, b. 28 Feb 1912, d. 21 Nov 1981, branch AF, enlisted 3 Jul 1951, released 18 Jan 1952."